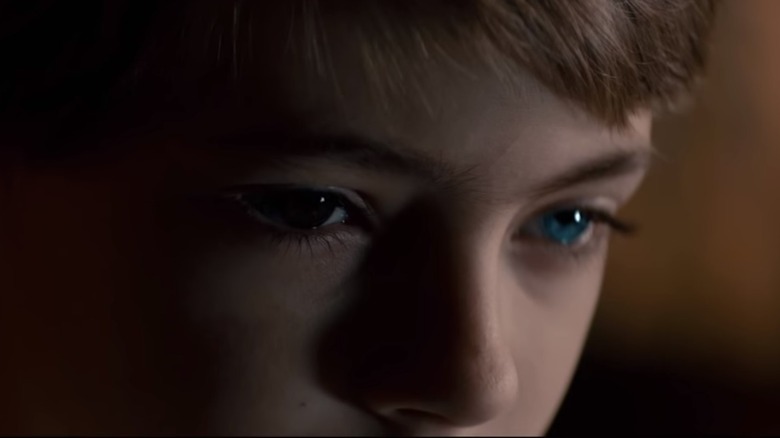 If you had to pick one message with which to walk away from The Prodigy, it would be this: creepy kids are creepy. One minute they're talking in their sleep and putting too much paprika on their food (monsters), and the next thing you know you're finding dog bodies in the basement and digging pruning shears out of your spleen. 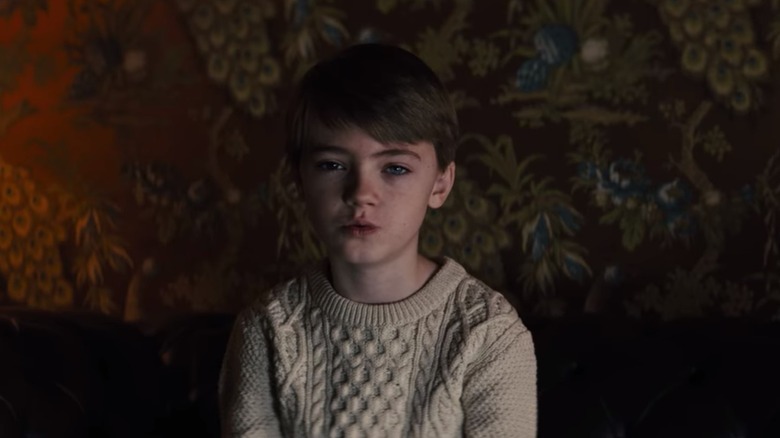 At a glance, The Prodigy seems to revel in the jump scares inherent in the "weird kids" horror subgenre. But lurking under the surface of this tale of alarming offspring is a deeper story of a mother's love, a child's place in the world, and even a little Buddhism for good measure. So maybe you stuck with The Prodigy to its sadistic end, or maybe you were too shocked by the sight of all that stomach blood to follow the final twists. Either way, you might have questions. Well, spoilers ahead — we're digging back through the ending of The Prodigy to figure out what it all meant. Even though the movie takes a while to build up to the full reveal, the main premise of The Prodigy is laid out right in the beginning. A montage reveals a police task force raiding the compound of a mysterious serial killer at the exact same time a woman named Sarah (Taylor Schilling) gives birth to a baby boy in a hospital. As soon as the man is shot to death, the infant pops out. Like a Live song come to life, his soul now belongs to the baby down the hall (or hundreds of miles away across the state line, in this case). 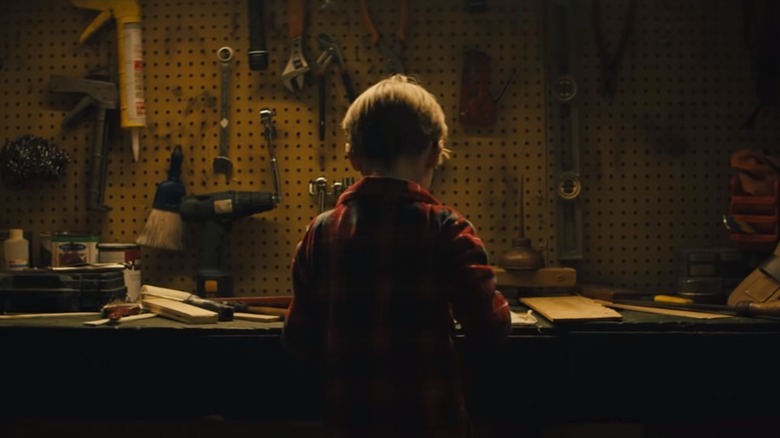 This scene introduces audiences to the basic building blocks of this story — it's Chucky as a real boy! But more than that, it also lubricates the audience's minds to the bizarre concepts of reincarnation and soul transference that come into play by the movie's end. 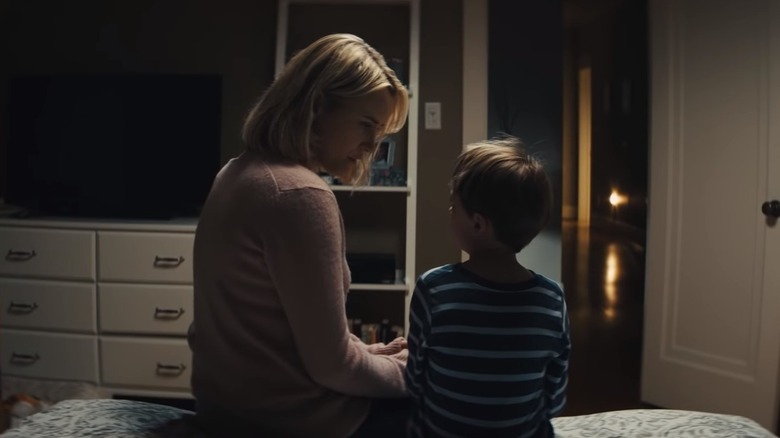 By giving away the big reveal before the opening credits even finish, The Prodigy has room to play with those ideas without putting the brakes on the story to explain how all this happened. We already know there's a serial killer's soul living in Miles. He's gonna do bad things. Clearly, The Prodigy leans heavily on the spiritual concept of reincarnation — when you die, you come back to life in another body. But in this movie world, the process is sort of like a ghost haunting an old house; that mean ol' spirit is only sticking around because it left behind some unfinished business. If you dig into some unfortunate parts of the internet, you'll find that The Prodigy didn't pull these ideas out of thin air. There was a guy in the first half of the 20th century named Meher Baba who taught that people were reincarnated to fulfill unfinished desires, and then left their reincarnated body once they'd fulfilled those desires. Of course, he also thought he was personally the reincarnation of God. Honestly though, with that hair, who could blame him? But The Prodigy's plot points draw from more than mystical gurus. The DVD that reincarnation maestro Arthur Jacobson (Colm Feore) gives Sarah in the film also comes from a real news investigation into a boy who claimed to be a reincarnated World War II pilot. Clearly, the idea was to present all these far-fetched themes as offshoots the real world, anchoring Miles' predicament — and the eventual outcome — within the realm of real-life possibility. So, let's talk about Miles (Jackson Robert Scott), the titular prodigy and proof that kids should never do their own Halloween makeup. This is a boy with two souls inside him, each acting on his psyche at any given time. It turns out that he's not actually a prodigy after all. All those special smarts are courtesy of Edward Scarka, the murderer who died at the beginning and caught the soul train into infant Miles. The movie plays with this duality constantly. From the heterochromia that gives Miles two different colored eyes to scenes with Miles' face halfway obscured by shadow, we're given no opportunity to forget that there's a killer in there. 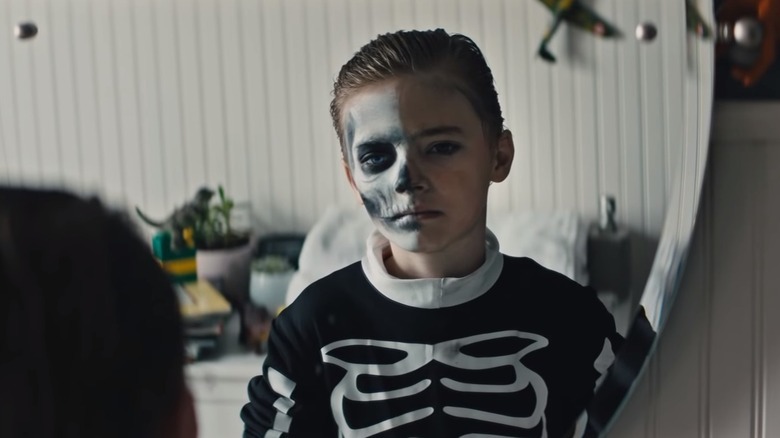 The most iconic moment comes when eight-year-old Miles wipes off one half of his skeleton Halloween makeup. Staring into the mirror, he sees half of a normal boy's face and half of a twisted skeletal visage that probably likes cutting off ladies' hands. It's at this moment that Scarka's mind starts entirely consuming the boy, leading him to commit some pretty vicious acts. As The Prodigy enters its final act, it finally finds a concrete direction. Once Sarah accepts the fact that Miles is possessed by another dude's soul, her working theory is that Scarka has some unfinished business that led him to stick around after his death. And once she finds Miles/Scarka's stash of reading material in Miles' bedroom, she knows what that business is: Scarka needs to kill Margaret St. James, who you may remember is the young woman who got away from him and led the police to his house in the opening scenes of the film. How far would a mother go to save her child? In this case, Sarah decides to help Scarka finish the job, reasoning that doing so will free his soul and cause him to leave Miles once and for all. So Sarah buys a gun and takes Miles/Scarka on a road trip to the far-away land of Ohio, intent on confronting St. James at her house. 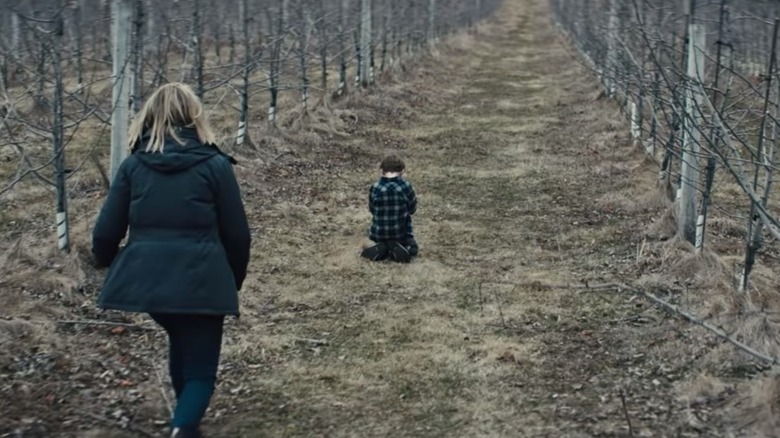 With this decision, The Prodigy veers out of Bad Seed territory and takes us down a new path. This isn't a family trying to survive their evil progeny; this is a mother who will stop at nothing to protect her son, even if it means murdering an innocent woman. The internal conflict Sarah faces as she contemplates shooting Margaret St. James is compounded by a shocking revelation — Margaret herself has children. By shooting her, Sarah would only save her own son at the expense of another mother. Like Miles' Halloween paint, the movie introduces this mirrored circumstance with the help of a literal mirror. Hands shaking, Sarah loads her gun in Margaret's bathroom, only to come face to face with… herself! In the mirror! She realizes that in a way, she'll be destroying the life of someone very much like herself in an effort to prevent the destruction of her own life. In the end, Sarah can't do it. She drops the gun on the kitchen table and accepts defeat. Miles is just gonna have to be a bad boy forever. That is, until Miles walks into the kitchen with a big knife and plunges it into Margaret St. James, finishing the job that Scarka started years earlier in the woods of Montgomery County, Ohio. 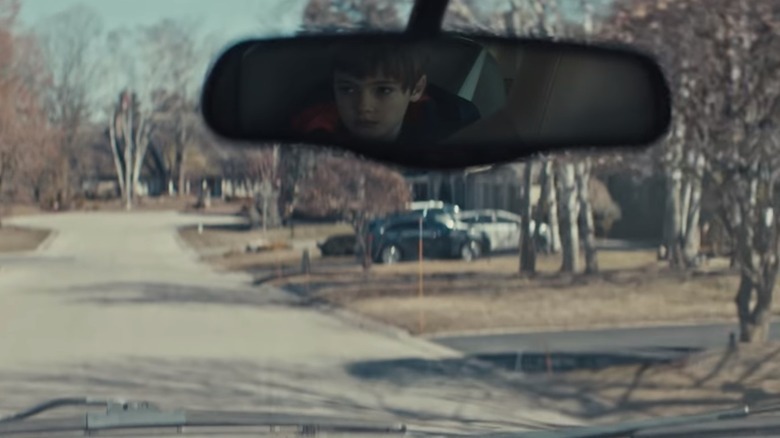 Miles isn't a kid you want in the back seat of your car, and Sarah knows this. Earlier in the movie, the boy stabbed his dad in the gut with a big pair of garden scissors and caused him to crash into a tree. That's the kind of thing that would totally ruin her plan, so before she starts the long drive to see Margaret St. James, she gives Miles a motion sickness pill that'll put him to sleep and thwart any unexpected gut stabbings. It appears to work. When they finally arrive at St. James' house, Miles is still fast asleep, giving Sarah time to take care of business without his interference. Unfortunately, she forgot the sage foreshadowing provided by Arthur Jacobson earlier in the film: Scarka is really, really good at pretending to be asleep. He literally said those words out loud just days before Sarah tried to drug Miles. Of course the boy's awake — he's possessed by an evil genius! So when Miles suddenly shows up in the kitchen, it's because Scarka was in control the whole time, just waiting patiently until the right moment to strike. And it isn't long before we find out how much control he actually has. At this point in The Prodigy, two things are clear: Scarka is more powerful than we'd realized, and Sarah is a terrible mom. Put them together, and the plan that's been unfolding in secret this whole time suddenly comes to light. Everything that Sarah has been doing to help her son — kicking her husband out of the house, driving to Ohio, trying to kill St. James — has all been carefully orchestrated by Scarka. Why? Well, Scarka really does want to kill Margaret St. James, like Sarah guessed, but he's stuck in the body of an eight-year-old. He can't just hop in the car and drive there himself. To that end, he's been subtly manipulating Sarah from the start. Remember when Sarah learned about Edward Scarka on her laptop, with Miles lurking in the next room? Sarah wasn't coming closer to stopping Scarka with that knowledge, as audiences were led to believe — Scarka was letting her discover the awful truth on purpose. Those breadcrumbs run through the entire film. A baseboard is just so carefully left askew, leading Sarah to discover a hidden stash of information on St. James. At her most vulnerable moments, Miles surfaces as a scared, innocent boy, stringing Sarah along with the hope that she still has a chance to save him. Scarka's plan was to get to St. James, and Sarah played the role of pawn to perfection. In the film's final twist, we realize that killing St. James wasn't the miracle cure Sarah had been hoping for. Scarka's still in control of Miles' body, and he's not planning on going anywhere anytime soon. After manipulating Sarah into taking him to St. James, Scarka now has another problem on his hands: Sarah. With John on life support in the hospital and Jacobson cowed into silence, Sarah is the last person who could threaten his new life. Ever manipulative, Scarka baits her with the truth: Miles is gone. She's too late. In fact, he claims that Miles hasn't been part of the equation since at least the halfway point of the movie. All of Jacobson's talk about a "war between souls" really meant nothing, because Scarka already destroyed the part of him that was Miles. Sarah takes the bait, threatening her son with the same gun she'd planned to use on St. James. Whether or not she ever intended on going through with it is unclear, because all that ruckus draws the attention of a farmer, who shoots Sarah before she can pull the trigger. All he saw was a woman about to shoot a kid. Once again, Sarah is too late. Maybe she can reincarnate into someone with a little more decisiveness. 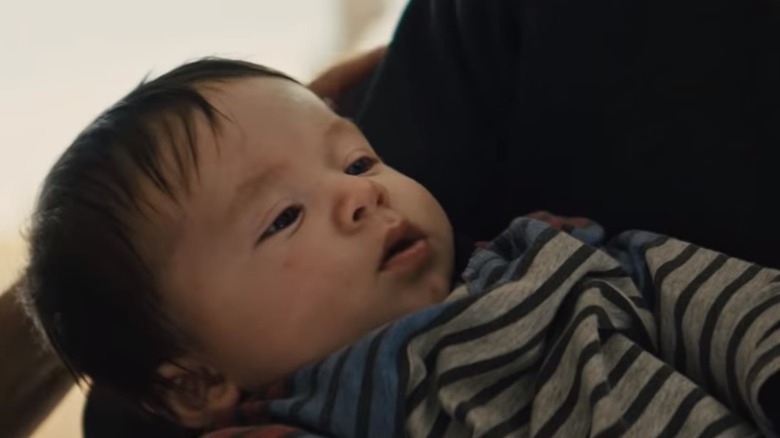 The final moments of the film see young Miles being dropped off with his new foster family. All innocence and smiles, the boy steps out of the car to greet his new mom and dad. That's when his foster mother extends her hand in welcome, causing Miles to go 700% creepy as he stares at it in the throes of his weird hand fetish. 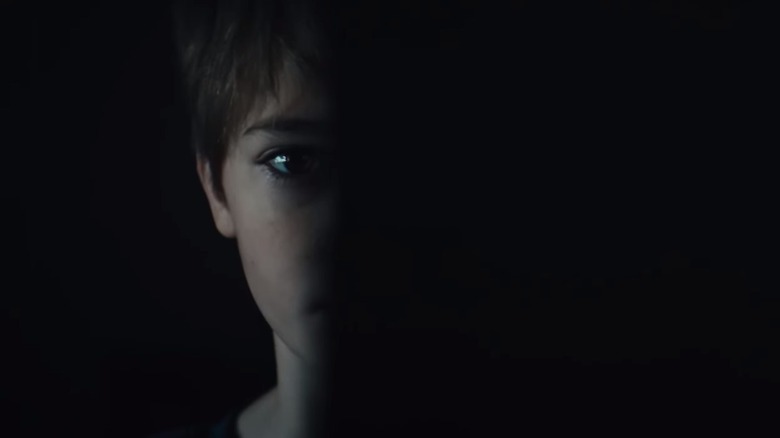 In one last scene before the final cut to black, we see Miles in his new bedroom with old man Scarka looking back at him from his reflection in the mirror, because ambiguity is for suckers. The message is clear: Scarka is free to kill again and again. Even better, he's not a lumpy old Hungarian man anymore. He's a young boy who can manipulate anyone with his sweetness, making him the ultimate wolf in sheep's clothing. But while that's the ending we see, is it really the ending? Hang on, because there may be more to this than meets the eye — no matter how many mirrors are in the room. The Prodigy leaves at least one big question unanswered. When did Miles actually lose the battle with the deranged killer living in his body? When Sarah first meets with Arthur Jacobson, the reincarnation hypnotist doesn't mince words. He explains that Miles is running out of time. The boy is locked in a mental and spiritual battle with Scarka, and it won't be long before Scarka gains the upper hand and completely takes over Miles. That ups the tension in the final half of the film because it leaves the audience wondering when (or if) Miles is going to finally buck the parasitic old man. We're led to believe there's a chance of redemption for Miles… but it's all a lie. After finishing off his final victim, Scarka-Miles coldly tells Sarah that her little boy is gone forever. Miles hasn't actually been in there since the night Miles asked Sarah if she'd love him forever, no matter what. What a jerk! But hold on, because lies come in many forms throughout The Prodigy. Jacobson also made it clear that Scarka is a masterful liar and a genius manipulator, so who's to say where his lies actually end? Would he admit to Sarah that part of Miles is still alive in there somewhere? Not if he wanted her to wave a gun at him so that hero farmer would step in. He'd pretend to have full control over the boy's body. But does he? At various times throughout the movie, Miles manages to exert some control over Scarka. Most notably, he does this when he's being hypnotized by Arthur Jacobson. 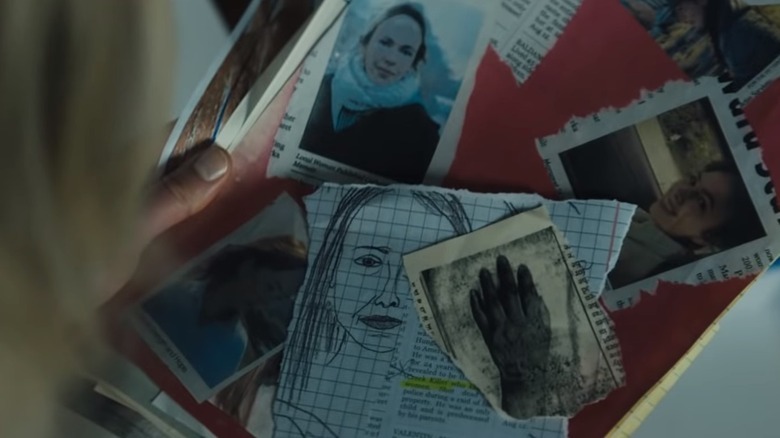 Although Scarka seemingly has total control in that scene, Miles still manages to scratch a legible message into a leather couch with just his fingernails. That's not an easy thing to do, and it suggests that Miles' mind may still be a bigger presence than Scarka is willing to admit… maybe even bigger than Scarka realizes. Of course, you could argue that Scarka did that himself as part of his impossibly convoluted master plan to reach Margaret St. James, but why go through all the trouble? If that was what he wanted, he could have just told Jacobson his name before threatening him into silence. The outcome would have been the same. On the other hand, if Miles was the one who left the message, it's possible that part of him is still capable of coming back and stopping Scarka in the future. Maybe he'll even pick up a few tricks from his mental roommate to make it happen. With a movie like this, anything's possible, whether it makes sense or not.